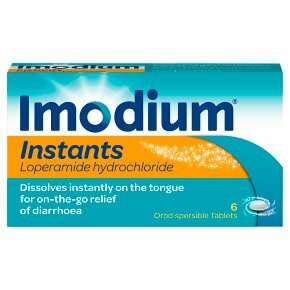 Dosage: Short-term diarrhoea: Adults and children over 12 years: Take 2 tablets to start treatment. Take 1 tablet after each loose bowel movement, up to a maximum of 6 tablets per day. If your diarrhoea lasts for more than 48 hours, consult your doctor. IBS diarrhoea, previously diagnosed by a doctor: Adults aged 18 years and over: Take 2 tablets to start treatment. Take 1 tablet after each loose bowel movement, or as previously advised by a doctor, up to a maximum of 6 tablets per day. You can use this medicine for up to 2 weeks for repeated attacks, but do not take for any one attack lasting longer than 48 hours. If your symptoms change, worsen or are not improved after 2 weeks, consult your doctor. Please read the enclosed leaflet carefully before use. To Open: Peel back lid from pocket, then tip tablet out. Do not push tablet through foil.